bad crafts happen | i made it so. bad crafts happen to good people. and sometimes, some ideas are just doomed from the start. some of you may recall this photo from a few weeks ago. well, that was just the start of it all. let me rewind a little. i was at a thrift store when i spotted a cute little ceramic tile with that bird design on it. it was adorable! the style, the colours. totally me. 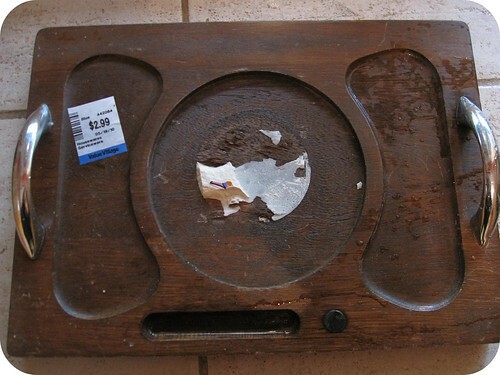 one problem: the tile was glued down to a very ugly cheeseboard. so it came home with me. and i showed it to my husband and explained how i wished i could just have the tile part of it. before i could even take a before photo of it though, he had the screwdriver and hammer out, ready to chisel away at the thing. the thing cracked. i wasn’t mad, as i had assumed it would break because it was old, brittle, and dang that was some serious glue! but then, those silly little gears in my mind got to creaking. you know, the ones attached to my creative cortex, which have been damaged by years of sleep deprivation and all that comes with motherhood. and i began to wonder if i could salvage it after all. salvage the tile, i mean, not the creative cortex. i think that damage might be permanent. so, ignore the fact that i’d never done a mosaic. and had no idea what to use to set the pieces. oh silly details, i shoo you away with a swift wafting of my magical creative hands! placed the pieces in the cement. and promptly ignored the fact that it looked really quite terrible. but yeah. it was pretty terrible. pictures trump denial in a heartbeat. ick. so i set it aside, in all its wonky glory, to dry out over the next few days, letting it bask in the sun of the back porch. the next day, mr.madeItSo and i headed out for dinner while my mother-in-law watched the kids. it was a gorgeous evening, perfect for playing outdoors, which is exactly what they did. like i said, some ideas are just doomed from the start. lesson learned? just use the cheese platter next time, as is, or put it back. © imadeitso, 2010. Unauthorized use and/or duplication of this material without express and written permission from this blog’s author and/or owner is strictly prohibited. Excerpts and links may be used, provided that full and clear credit is given to ana at imadeitso.comwith appropriate and specific direction to the original content. 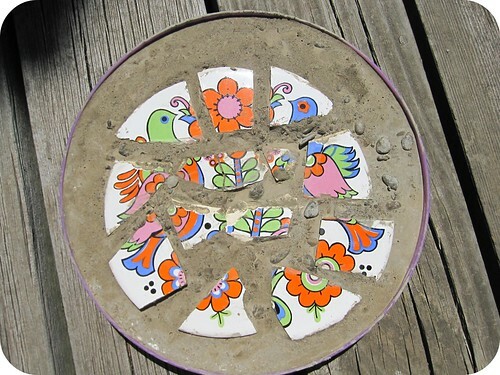 This entry was posted in something old, something new and tagged cement, ceramic tile, cheese tray, crafts gone wrong, mosaic, oops. Bookmark the permalink. 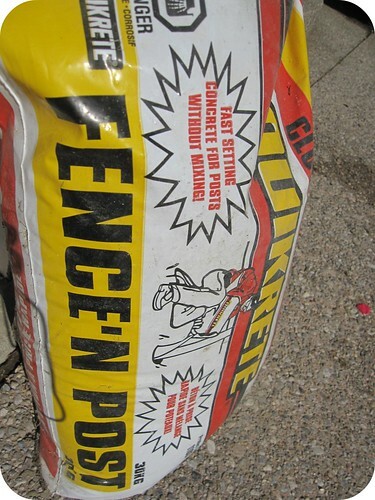 They do make stuff for repairing concrete called vinyl patch, part vinyl and part concrete. What I did, when a cute yard sale tea pot fell to it’s death on the rock bench under the apple tree, was place the broken pieces randomly throughout the strawberry plants turning the planter into it’s own mosaic masterpiece. Oh, have I had days like that! In fact, I’m a pretty sorry crafter. I try, but they rarely turn out the way I envision. Oh my! I’m sorry, but that is too funny! Sounds like something I’d do (C: Thanks for stopping by today!! Oh, your story has a purpose – to make people laugh, like I laughed reading this – right from the roots! I so connected with you! I have happy accidents all the time! Thanks for dropping a comment on my blog – makes life a little bit more magical! i don’t know whether to say i’m glad you can relate, or i’m sorry you can relate ;) and thanks for commenting too! we could all use a little magic (some more than others, hehe). It seemed like a good idea to me too. I enjoyed reading along to see how it all turned out…or not. 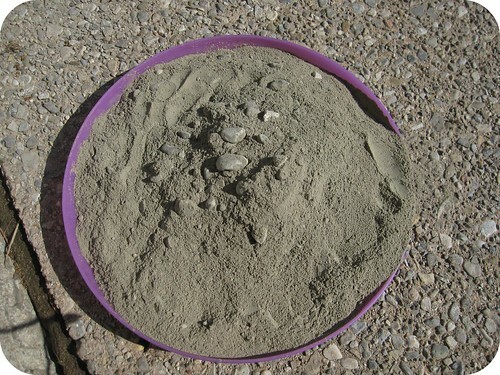 In gardening magazines, there are regularly articles about how to make a mosaic bird bath by setting bits of ceramic in concrete. I think they usually call for just digging a bowl shape in sand to act as a mold, but I haven’t tried this myself. glad you enjoyed the read :) sometimes, you just wanna get going on a project, you know? but a little research may have helped me on this one. that’s interesting about the sand as mold. Oh My, I was hoping for a happy ending! Your plate/cheese tray had quite an adventure! it could tell a few stories! You should post your story to Craft Fail: http://craftfail.com/. 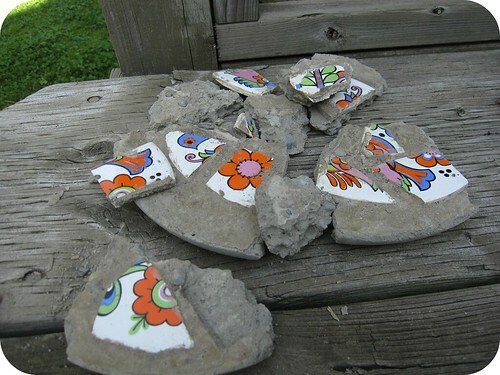 I was sorry to see your cheery little ceramic in pieces. Oh, thank you for brightening my Monday morning, Ana. This story truly cracked me up and I love the photos to go along. I’ve had so many crafts fail. You should see this pink dinosaur shirt I tried to make for Jackson (she was so into dinosaurs and yet all dinosaur shirts are “boy colours”)…I love your photo story style. Who knew crafting could be so suspenseful! The new pics at the top of your blog are great too. well you just brightened my morning tara! thanks so much. there’s just something so humbling and funny about crafts gone wrong… not when you’re in the midst of it, of course, but always in retrospect. makes you really appreciate the ones that DO turn out! Thanks for stoppin’ by for a Latte’. If I was craftier this would look great in my garden. Hope you have a good start to your week! Ana, I think this story is tragic. That pretty little bird, all in pieces in the dirt. So sad. But, someone else I know might say you should have known better than to use a frisbee (even an old one) for something other than its true purpose! This same person might even be secretly delighted at the zeal with which the kids busted up your creation, in order to get to the frisbee… I’m sure this person would also feel your pain. What do they say about being given lemons, lol. I don’t do mosaics, but I’ll bet someone will come along and help you figure this one out. Thanks for visiting me over at Pittypat Paperie. Pingback: i’m not sure i should be flaunting this, but… | i made it so. thank you mary. you’re absolutely right, we learn something with each mistake! Pingback: do you toss your cookies? | i made it so. I can totally relate to your experiance. It seems like such a good idea at the time..
Pingback: ideas | i made it so. Oh my! That was a darling tile. You definitely made a valiant effort to give it a new life! Hahahahaha. Hilarious! I didn’t even like the tile, but by the 5th line in the story, I was rooting for it with all my heart. “Silly details,” “easy directions,” “clever, clever duck!” – love it all. Oh dear! I have a teapot stand with a tile on it that I want to remove but I just knew this would happen so it sits there waiting for divine inspiration. I am an amateur mosaicist and I would say to you that the type of pottery you have there is not suitable for outdoor use, it would have crumbled with the frost. 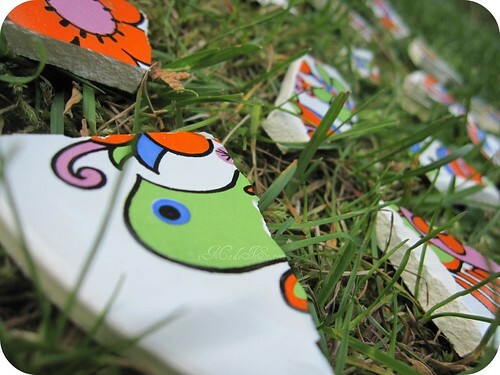 Use vitreous china shards for outdoors. Use wallpaper paste to glue your shards temporarily face down onto brown paper cut to size and lay that in the bottom of a flexible mould that has been vaselined. Then put chicken wire in the mould to reinforce. 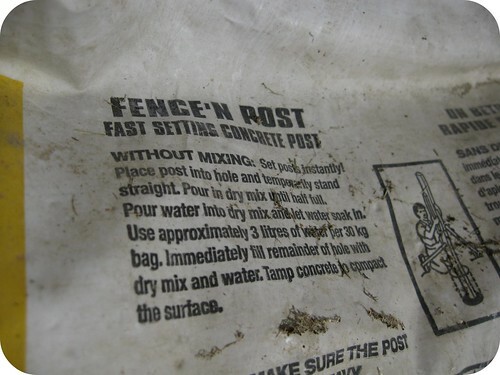 use readymixed sand/cement mix if you like (no stones) but do not use post filler, it dries too fast. Don’t touch it or move it for a couple of weeks after pouring the concrete. Finally unmould it and give the paper a wetting with a sponge to remove. It may need a bit of a clean. i’d follow the broken teapot ladie’s lead and scatter the bits in the garden, next to flowers like calendulas. I love the bits. Reminds me of treasures from the sea! i love sea glass! and i’d consider doing that, *if* there weren’t little hands and feet that liked to play in the garden too :) thanks for visiting susanne, and commenting on an older post… always fun to go back in time.